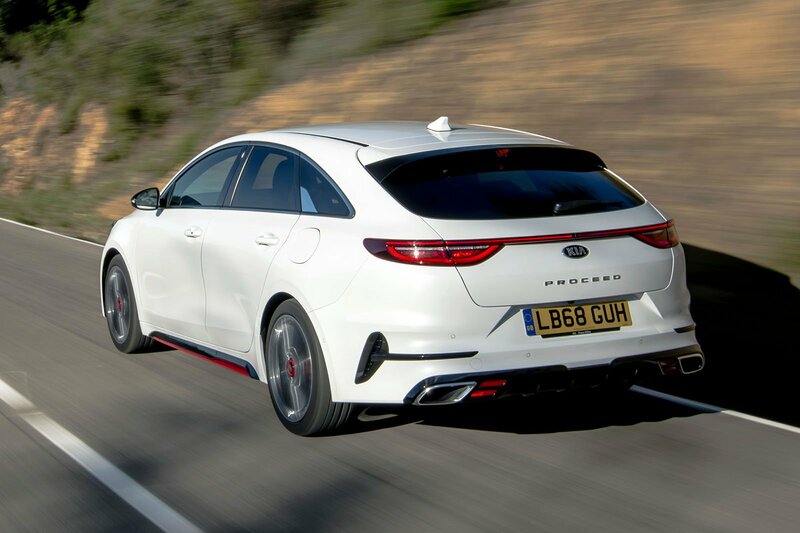 2019 Kia Proceed review – price, specs and release date | What Car? If you remember the old Kia Proceed you might remember that it had a great deal more punctuation and two fewer doors than this new model. 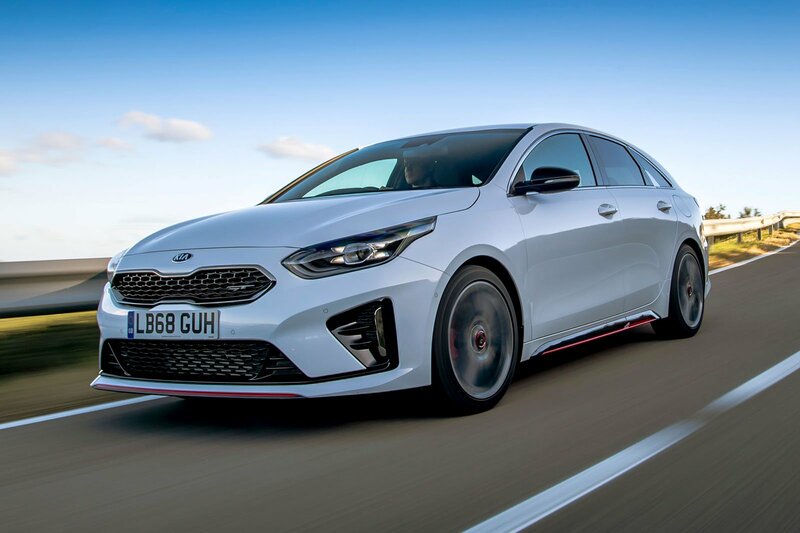 Eyeing a time when SUVs and crossovers are, perhaps, not the only answer to having a fashionable, practical family car, Kia has introduced this sleek five-door wagon alongside its existing five-door hatch and estate (Sportswagon) Ceed. The Proceed is 5mm longer than the Sportswagon, its roofline sits 43mm lower, while the ground clearance is also reduced by 5mm. In the family car arena, only Mercedes-Benz, with the A-Class based CLA Shooting Brake, does something similar – and the Mercedes is a premium competitor. Kia, a more mainstream brand than Mercedes, still thinks it can learn from the CLA, though. Buyers typically spend more on a CLA Shooting Brake than they do on other CLA/A-Class models, so Kia reckons the new Proceed is worth introducing in three higher specifications: GT-Line, GT-Line S and a performance-focused GT. Three engines are available ranging from 138bhp up to 201bhp for the range-topping GT. The trouble is, like-for-like all Proceeds will cost more than the slightly bigger Ceed estate. So, although the Proceed might have added visual allure, is there any other reason to choose it ahead of other versions of the Ceed? In all, there are three engines in the lineup. If you want to keep things sensible, there’s a 138bhp 1.4-litre petrol badged 1.4 T-GDi and a 134bhp 1.6-litre diesel engine badged 1.6 CRDi. Both engines are available with a six-speed manual gearbox or seven-speed dual-clutch automatic – opt for the GT-Line S version, though, and you’re only allowed the 1.4 T-GDi with the automatic. At the top of the range you have a 201bhp 1.6-litre petrol engine (1.6 T-GDi) that powers the auto-only GT variant. In the range-topping version the power delivery is strong – there’s a broad spread of torque, and it kicks from low revs. That gives very flexible performance that’ll help see off a motorway overtake with ease. A prod of the ‘sport’ button sharpens the accelerator pedal’s response further and also livens up the soundtrack. The engine sound is partly electronically enhanced but sounds pretty rorty nonetheless. Gearshifts are quick and smooth, but when you’re driving quickly and asking a lot of it then the ‘box can feel a tad behind the beat. We’ve also driven the 1.4 T-GDi which is reasonably flexible, but while it’ll get up to motorway speeds and cruise along without huge effort it does feel strained if you give the accelerator an enthusiastic prod and ask for a quick burst of pace. But it’s only at those higher speeds where it disappoints slightly, around town it doesn’t irritate. Emissions and fuel efficiency, meanwhile, are competitive, with the diesel – which we’re yet to drive in the Proceed – predictably proving to be the best of the lot, while the higher-powered petrol GT is on the thirsty side. 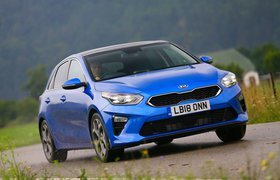 Kia is quite proud of how much effort it puts into its cars’ ride and handling, and the Proceed drives really well. The ride is composed, firm but not uncomfortable, while the handling is both secure and quite entertaining at the same time with little body lean. Few cars in this class – perhaps the Ford Focus and Volkswagen Golf are among them – are more pleasing to drive. Kia offers as an option Michelin Pilot Sport tyres, which are premium, semi-sporting rubber. That’s all we’ve driven the car with so far, but while they are properly grippy it’s hard to imagine too many buyers ticking the box. The interior looks much like any other Ceed: of decent enough feel given the price, and with sound ergonomics. The sloping roofline towards the rear and the steeply raked rear window don’t inhibit rear accommodation or boot space severely either – the only drawback is a slightly obscured view out of the back. At 594 litres, the Proceed’s boot is only 11 litres shy of a Volkswagen Golf estate’s and 16 short of the giant Skoda Octavia estate’s. It’s also only marginally smaller than the Ceed Sportwagon’s, which gets 625 litres, however it gets a smaller opening and lower roofline, which does impeded its practicality somewhat. Still, it’s certainly up to the task of being a main family car. 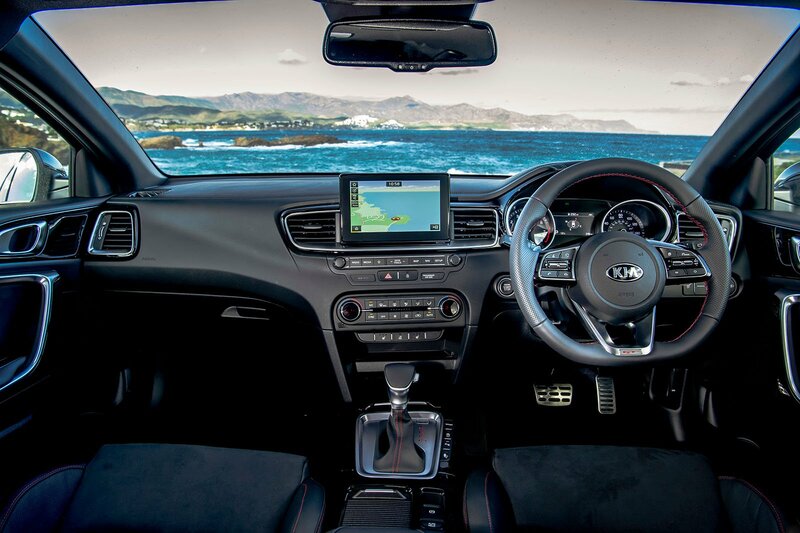 The rear seats are spacious enough for a near six-footer to comfortably sit behind the same size front seat occupant, although Kia’s research suggests that most small estate buyers are more worried about boot versatility than overall rear seat space. However, 60/40 split-folding rear seats are standard, and you need to up your trim level to GT-Line S to get 40/20/40. There isn’t a flat load lip like on the regular Ceed Sportswagon estate (blame the location of the number plate), but there are floor rails on which you can spec versatile luggage restraints. A note on trim levels. While the GT model sits at the top of the range for performance, GT-Line S (only available with the 1.4 T-GDi engine and auto gearbox) is strangely priced slightly above it even though it’s majorly down on power, with GT-Line propping up the range at the bottom available with the diesel or petrol. GT-Line is well specced as standard. An 8.0in touchscreen infotainment system with sat-nav, DAB radio, Android Auto and Apple CarPlay comes as standard, along with a reversing camera and rear parking sensors. Move up to GT-Line S and you get bigger alloys, LED headlights, a sunroof 10-way electrically adjustable driver’s seat and a leather interior. Heated outer rear seats, adaptive cruise control and power tailgate also feature. You also get a system that helps the car park semi-autonomously, as well as an upgraded sound system, front parking sensors and wireless phone charging. GT is based on GT-Line but gets 18in alloys and some sporty exterior styling.